The Avari Towers Asia Live Cafe brings you closer to the world cup in South Africa. Join us in the Asia Live Cafe where all matches will be televised live from June 11th. Cheer your team to victory in a fun and relaxed atmosphere. Complimented by an appetizing cafe menu. No entry fee. Admission is reserved for persons over the age of 21. Etihad has signed the internationally acclaimed Pakistani pop-rock band Strings as the airline’s new brand ambassador. Having won numerous national and international awards, Strings has acquired a huge global following. Etihad and Strings are working on a series of initiatives during 2010 and aim to promote music and culture in Pakistan and around the world. See a report of the events in Pakistan on the official Etihad Airways YouTube channel. You can get some very nice deals when you show your Snob Membership Card to our participating merchants. Here are some deals that are on now. Click here to see the rest! Get 3 Free Hours of Play when you register your child at Kidz Klub. Plus, save 10% on Kid's Birthday Party Bookings. Just show your Snob Membership Card. The Age Discount is back on Tuesdays at Sanctuairie Spa. That means if you're 40, you'll get 40% off, WOW. Just bring your I.D. card and and Snob Membership Card and get a discount equal to your age. Sign up for classes at BodyBeat and get your registration fee waived when you show your Snob Membership Card. Get 25% off all menu items on Saturday and Sunday at Cinnamon Lounge at Avari Towers when you show your Snob Membership Card. Enjoy a Free Chocolate Monkey Smoothie when you purchase any two sandwiches (panini, wrap or bread sandwiches) and show your Snob Membership Card. Order 2 or more entrées and receive a Free Chili Poppers Appetizer when you mention your Snob Membership Card number. Order any two lunch or dinner entrées and receive a Complimentary Warm Lindt Cappuccino Chocolate Brownie with Ice Cream when you show your Snob Membership Card. Get a Free Elbow Room Basket Appetizer with the purchase of two dinner entrées on the weekends. And save 15% on your total bill for bookings of 10 people or above. Plus, get a 20% discount for 10 people or more on your home or office catering order. And last but not least, save 15% on all Elbow Room events (e.g. jazz nights). All just for Snob Members. Get 10% off any home accessory item at Home Kraft when you show your Snob Membership Card. Go Ahead... They're Waiting For You! The Snob Membership Card. Not New, But Very Now. The Snob Membership Card entitles you to continuous discounts, special offers & exclusive gifts throughout the year from the best places in Karachi. Support KarachiSnob's efforts to bring fun and positive energy to the city by purchasing your Snob Membership Card for Rs. 1,200. Traveling To Islamabad? We Have Really Good News. We are extremely excited to announce that IslamabadSnob.com will be online and ready for your viewing within a few shorts days. LahoreSnob.com is getting more exciting by the day, so don't forget to use all of our Snob websites for your convenience and enjoyment when traveling. Suggest your favorite places by submitting the "suggest a listing" form located at the top right-hand side of all pages. Find the best places for breakfast & Sunday brunch in Karachi. Enjoy your breakfast favorites such as mushroom & cheese omelets, eggs benedict, pancakes, blueberry French toast with maple syrup, bagels with smoked salmon, qeema paratha, fresh juices and much more. We know you've been waiting for this, so just click here! Use the KarachiSnob.com Events Calendar to find the "Snob Approved" events in the city. Updated regularly for your convenience. Scroll down below calendar to add your own events. Who said there's nothing fun to do in Karachi? View The Events Calendar! This entire Newsletter and its contents are copyrighted by KarachiSnob under local and international Intellectual Property and Copyright laws. Duplication of this material is strictly prohibited. To be considered for a listing on our site, submit your business information to suggest a listing. You are currently subscribed to The KarachiSnob Newsletter. Celebrate Mom this year with some of these Snob Worthy Gifts! 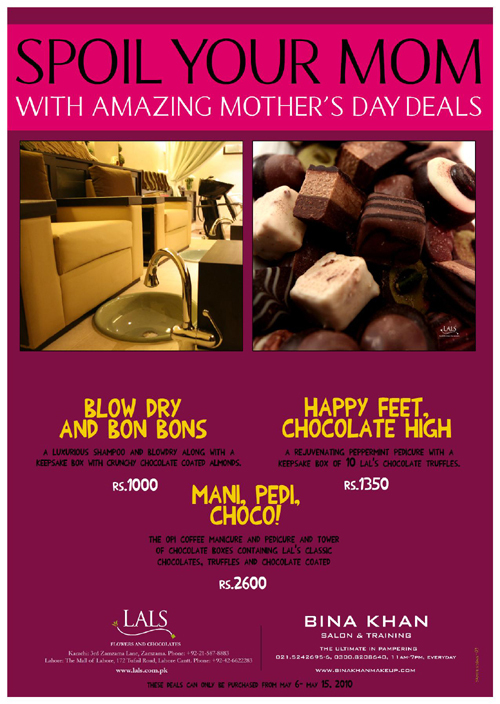 Choose from the "Blow Dry & Bon-Bons", "Happy Feet, Chocolate High", or the "Mani, Pedi, Choco!". Deals can be purchased from May 6th to May 15th. Visit Babyshop on Mother's Day for your chance to win one of many exciting gifts. Prizes will include dinner for two at Avari Hotel, gift vouchers at OSG Spa and Gym, hair treatments, manicures and pedicures by Alle'Nora, gift hampers by Scentsation, Johnson and Johnsons, Alkaram, free subscriptions by Expert Parenthood magazine and Exclusive Snob Membership Cards by KarachiSnob.com and more. Plus, mothers who spend Rs. 5000 or more will be entered into a bumper draw to win a one-night stay for two in one of Avari Towers' new luxurious rooms. Pamper the No. 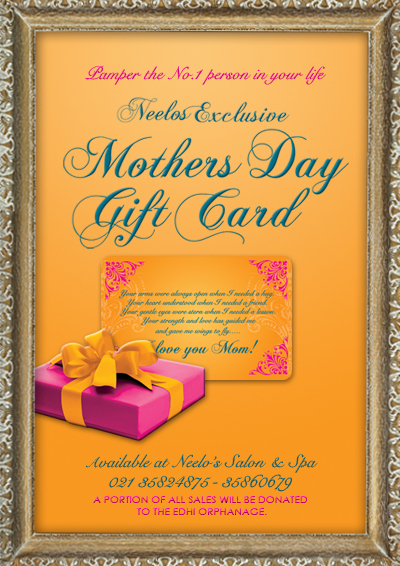 1 person in your life with Neelo's Exclusive Mother's Day Gift Card. Give Mom the special gift of relaxation. Presented in a gift box that Mom is sure to appreciate. 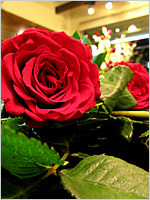 Sanctuairie Spa is offering a special Mother's Day deal for two. Get one Aroma Therapy Massage and the second one is 50% off. A perfect way to enjoy this special day with Mom. 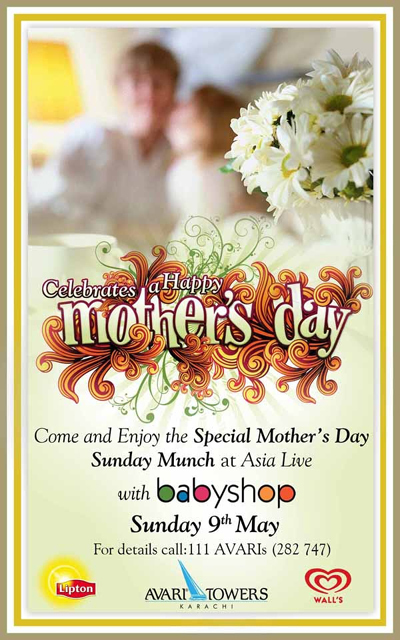 Come and enjoy a special Mother's Day Sunday Munch at Asia Live at Avari Towers with Babyshop on Sunday May 9th. Possibly the most peaceful ambiance in Karachi! On Mother's Day, treat your Mom with our mouth watering brownie with a scoop of vanilla ice-cream with your order of at least Rs.1000 (exclusive of taxes). 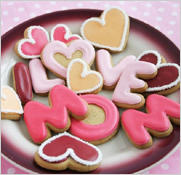 Get back to your playful nature by baking some festive cookies for Mom. A fun project for the whole family. 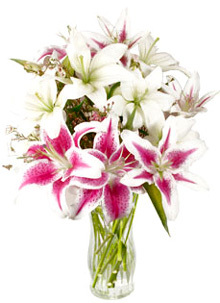 Give them to Mom (and Aunties) in a beautiful box for a creative and heart-felt gift. Combine 1 cup butter, sugar and egg in large bowl. Beat at medium speed, scraping bowl often, until creamy. Add orange juice and vanilla; mix well. Reduce speed to low; add flour and baking powder. Beat until well mixed. Divide dough into thirds. Wrap each in plastic food wrap; flatten slightly. Refrigerate until firm (2 to 3 hours). Heat oven to 400°F. Roll out dough on lightly floured surface, one-third at a time (keeping remaining dough refrigerated), to 1/8- to 1/4-inch thickness. Cut with 3-inch cookie cutters. Place 1 inch apart onto ungreased cookie sheets; sprinkle with decorator sugar if desired. Bake for 6 to 10 minutes or until edges are lightly browned. Combine powdered sugar, 1/3 cup butter and 1 teaspoon vanilla in small bowl. Beat at low speed, scraping bowl often and gradually adding enough milk for desired spreading consistency. Tint with food color, if desired. Frost and decorate cooled cookies as desired. If you use a 4 to 5-inch cookie cutter, recipe will yield approximately 2 dozen cookies. Avari Towers Brings You Fun & Excitement This Eid! Avari Towers is featuring Mini Golden Eid Munch at Asia Live all three days with a special promotion which offers a free Avari Gold Card to all guests. Open from 12:30-3:30 and priced at Rs. 899. There will also be a jumpy castle and gifts for (well-behaved) kids! Dynasty and Fujiyama are open for dinner from 7:00pm to midnight, with Asia Live open as a café and with an exciting new menu. KarachiSnob Cardholders get a 10% discount over the three day period at all outlets. Plus get a 50% discount on rooms in all categories. Just show your Snob Membership Card and ID to redeem the deals. Luxury Special Just For Snobs! Avari is offering a Special KarachiSnob three-night Eid stay for Rs. 30,000 plus tax for two, inclusive of all meals and snobby pampering. Relax and enjoy with Avari's refined ambiance and friendly, attentive service. Plus, Wi-Fi throughout the entire hotel. For exclusive special offers on Dining, Shopping & Entertainment at your favorite “Snob Approved” merchants. The Snob Membership Card entitles you to continuous discounts, special offers & exclusive gifts throughout the year from the best places in Karachi. Just show the Card at our participating Snob Approved merchants to enjoy the current Snob Specials. The deals change from month to month, so you can view them regularly by visiting our Snob Specials page. Plus, you'll have a chance to win the online giveaways, in which only those with a Snob Membership Card will be eligible. Being a Snob definitely has its benefits! The Snob Card is priced at Rs. 1200 and is valid until December 2010. · Get a small box of chocolates when you spend over Rs. 1000 at Lals. · A free pair of Misaki Pearl Earrings when you purchase any Guess watch at Lifestyle Collection during Ramadan. · A Free Appetizer from Chairman Mao. (up to a Rs. 360 value) when you mention KarachiSnob.com. Choose from; Spring Rolls, Fried Wontons, Stuffed Chillies, Prawn Toast & Fried Prawn Balls. Minimum order is Rs. 500. · Pond's is offering four special Eid Packages. Take the Pond's online tour for details. · Visit the "new" Alle'Nora by Aliya Tipu for your favorite Eid services at very special discounted rates. Plus, get free Mehendi. Take a Tour for more details. · Save 15% on any regular priced item at the Studio S Dolmen Mall location. View the entire list of Snob Specials! Visit these fine businesses for everything you need this EID! Use our convenient Bakery category to find the best bakeries in town for your Eid cakes and pastries during this Eid holiday week. Some events come and go without ever making their presence on our Events Calendar. And that's not good for anyone. So the next time you come to know of an event, from Expos to designer clothing exhibitions to Sales in the City, just let us know about it. Easily submit your events on our Events Calendar! We're giving away Special Iftar Dinners to our lucky Snob Card Holders throughout Ramadan. You have a chance to win one of these special Iftar Dinner Giveaways at one of the top hotels & restaurants in Karachi, such as the famous poolside Iftar Dinner Buffet at Avari Towers; Fuchsia, which offers flavorful Modern Thai cuisine with an artistic twist; The Sports Bar for a friendly and upbeat atmosphere; Aqua Lounge for fresh seafood; Rangoli at Arena... and the favorite Café Aylanto. Just fill out the questionnaire to enter. Find the best deals for Iftar & Sehri this Ramadan on our special Ramadan Restaurant Guide. Complete with prices, phone numbers, menus, pictures and more. Updated daily, so check back frequently and always refresh your browser. KarachiSnob.com, ... dedicated to making sure you have less stress and more fun in Karachi! Ramadan Mubarak! View the Ramadan Restaurant Guide now. By popular demand, we present "SALE IN THE CITY" , a page where you can find all of the major sales events in the city. Coming Soon. A luxurious and relaxing gift worth over 4,000 rupees. You must be a Snob Member to win, so click here to get your Card if you haven't already. Then check KarachiSnob.com regularly for a chance to win this, and many more, upcoming giveaways. During Ramadan when you dine at Avari, get a free Avari Gold Card for one month, which entitles you to very generous discounts at the fine restaurants and other amenities at Avari Towers. Also at Avari, get a 10% discount on Avari's famous poolside Iftar Buffet when you show your Snob Membership Card. There's Hope! ~ The Events Calendar. GET YOUR "SNOB WORTHY" BUSINESS LISTED ON KARACHISNOB.COM.